No Tobacco Day is held on May 31 every year to highlight the health and other risks associated with tobacco use. Tobacco control is considered as one of the most effective means to help achieve one of the United Nation’s Sustainable Development Goals – reducing premature deaths from noncommunicable diseases by one-third globally by 2030. 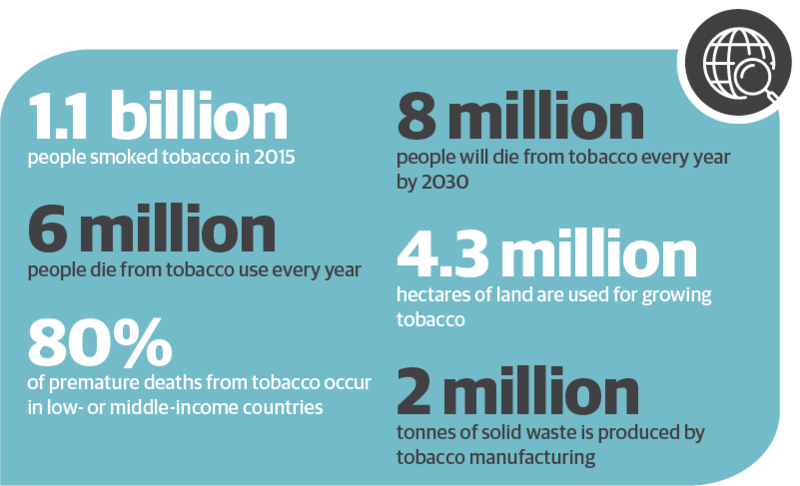 In addition to saving lives, comprehensive tobacco control also helps to contain the bad environmental effects of tobacco growing, manufacturing, trade and consumption. This year’s campaign aims to highlight the threats that the use of tobacco pose to the development of all countries. It also suggests measures for governments and the public to implement to promote health and development. The prevalence of tobacco smoking appears to be declining worldwide, but it is increasing in the African region. Although only 2% of cigarettes are smoked in Africa, 6% of smokers live here. Under current conditions, the American Cancer Society study projects that by 2060 Africa will have the second-most smokers of any region (behind Asia) with 14% of the world’s smokers. By 2100 it projects Africa will be home to 21% of the world’s smokers. A Lancet Survey showed great disparity within the continent. Some African countries ranked among the world’s lowest incidences of tobacco smoking, including Nigeria, Ghana, Ethiopia and Guinea. However, the continent also has some highest ranked smoker-countries, like Tunisia, Egypt and Libya. Mozambique’s growth in cigarette consumption over the past 16 years was a shocking 220%. Mauritanian smokers consume around 41 cigarettes per day, which is the highest number in the world.